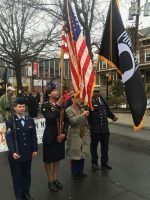 Led by American Legion New Haven Post 210 Color Guard formed by Color Guard Captain Richella Rondon-Smith, the New Haven Veterans group with the VFW New Haven took top honors as the Best Senior Military unit in the 2019 Greater New Haven St. Patrick’s Day Parade. The American Legion New Haven Post 210 and the Department of Connecticut celebrated the 100th anniversary of the forming of the Legion by signing the new post’s permanent charter. 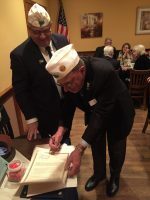 Department Commander Tom Flowers and Adjutant Harry “Butch” Hansen signed the document at the conclusion of the sold-out dinner at Adriana’s in New Haven.